I read this tweet and smiled, because I’ve done the same thing, as have so many others. Marissa Miller once tweeted, “adulthood is emailing ‘sorry for the delayed response!’ back and forth until one of you dies” and her tweet got shared 27,000 times, so this obviously resonates with a lot of people. Sorry for the delayed response. I opened your e-mail on my phone while my date was in the bathroom, but then I saw that it required more than a “yes” or “no” reply, decided that was too much work, marked it as unread, and then forgot about it entirely until just now. So how can we avoid the delayed response syndrome? When … are you supposed to reply? Sometimes people make this clear, explicitly noting that they need an answer by the end of the day, or week, or whatever. But this doesn’t happen as often as it should. So try helping your email recipients by making it clear just how urgently you need a reply: right now, tomorrow, by a specific future date, etc. You can also adopt the practice that Tsh Oxenreider describes on her blog, The Art of Simple: her friend Sarah ends some emails with “No need to reply!” Not every email requires a response, so it helps to make it explicit when no response is expected. Also, make it easy for your recipients to see exactly what response is needed. A few days ago I got an email from my brother with five numbered questions, and it was extremely easy to respond quickly — and I knew he needed a quick response because he told me that. Each question was brief, including exactly the information I needed in order to answer. Did I want to go to either of two choral performances (with dates and location provided)? How did I feel about a potential family reunion at a specific place on a specific date? If only all my emails were that easy to handle! If it’s not clear when a response is needed, you can write back and ask. This will help you respond appropriately, and it might also train your correspondents to include this information in the future. As we’ve discussed before on Unclutterer, you can create your reply faster by using a text expansion tool to handle frequently used text. But the advice I read that I personally found the most meaningful came from Melissa Febos, writing in the Catapult online magazine and addressing her fellow writers: “Stop trying to get an A+ at anything but writing your best work.” The specific thing you’re trying to get an A+ in may be almost anything, but it probably isn’t email replies. Yes, work emails require professionalism and clarity. But I know I’ve sometimes spent way longer on an email response than was necessary. The latent perfectionist in me likes those A+’s, but I know that my time can often be spent more wisely. A few weeks ago, Alex wrote about dealing with the clutter of previous generations. It took me back to my childhood when my extended family pulled together to sell my great-grandfather’s farm. That was back in the day where you hired an auctioneer, put ads in local newspapers, and all the neighbours in the county showed up to bid on items the family had dragged out onto the lawn. Times have certainly changed. Family members live all over the country, neighbours don’t necessarily know one another, and online auctions are the norm. 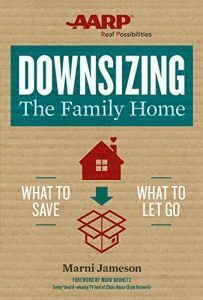 Marni Jameson’s book Downsizing the Family Home is very helpful to those of us in the modern world dealing with liquidating a family estate. I expected this book to be rather dry; a “how-to” book full of instructions and checklists. Instead, this book was a warm and compassionate recounting of the author’s own experience as she cleared out and sold her childhood home, and helped her parents transition to a retirement centre. She writes like she’s talking to her friends. I chuckled to myself when Jameson recounted how she found “bundles of Christmas cards saved by year going back to William the Conqueror” as well as, “…enough baskets to re-create the miracle of the loaves and fishes.” Many families have similar collections that have to be sorted and disposed of. However, this isn’t a novel. Jameson shares the information she learned from the experts she consulted and provides many hints and tips throughout the book. It is full of useful information on how to dispose of items — whether to sell, recycle, donate, or just take to the dump. There are several chapters dedicated to helping readers find resources to determine the value of antiques, artwork, and other family heirlooms. One useful thing I learned was that in most families the stories surrounding family heirlooms are often wrong. For example, though generations have been told the story of great-grandma’s Tiffany® lamp, it may actually be just a replica. Some items may not be as valuable as expected but if it is a piece you love and has significant sentimental value, it doesn’t matter what its re-sale value would be. The book also provides advice and suggestions on preparing and selling a home and tips on dealing with real estate agents and the challenges that occur when the adult children live across the country. One of those challenges being the emotional anguish of letting go of your childhood home. Downsizing the Family Home was an enjoyable book to read. 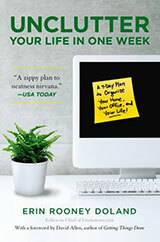 If there is a downsizing process looming in your future, you’ll find this book extremely helpful. 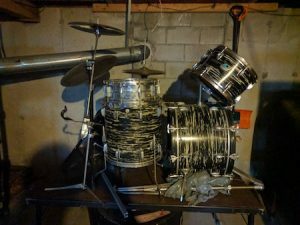 Last week, I shared the story of my inability to let it go of my drum set during our big basement clear out. I had succumbed to sentiment! After much deliberation, I’ve made a decision — the drum set stays — for now. There’s a deal in place, which I’ll describe in a bit. First off, I’m going to refurbish them. They need new heads, a good tuning, some cleaning, and maybe some new hardware. (The bass pedal is older than my marriage.) Once the upgrades are done, I’m going to play a bit and see how it feels. I’ll adopt a regular practice schedule and see if I can stick to it while working off the years of rust. Perhaps my kids will express an interest. If so, I’ll provide lessons. Selling is the most obvious choice. These drums are very old and not worth a lot, so I’d give them to a young musician who is looking for his or her very first set. It would be nice to see them inspire a student they way they once inspired me. Donation is also an option (and I can get a tax write-off too). I’m sure a local community center, church, or school would gladly take a free drum set. I could get real fancy and turn them into art, but that’s a bit beyond me. Parting with sentimental clutter is never easy, but it’s something we must do eventually. Memories are more important than the things themselves and great memories are never clutter. Additionally, here’s a good opportunity to practice the concept of non-attachment. It reminds me of this little parable, the origin of which I do not know. In a way, my drum set is already gone. Some day it will fall apart, or be in the dump, or reside in somebody else’s basement, or I’ll be too old or frail to play it. And that’s OK, because every moment I’ve had with it has been precious. We live in a condominium of 15 floors with 4 units per floor. While that might not sound like a lot of units to high-rise dwellers in cities like Toronto or New York, here in the Basque Country, it’s considered a huge number of neighbors. While normally we are quite happy with the set up, at times having so many neighbors can create friction, such as when work needs to be done on the building as a whole. Over two years ago, shortly after we moved in, the company that administers the building announced that the government was requiring an inspection of the state of the building (it’s over 50 years old). This study revealed that while the façade is in good shape, many balconies and window sills are in danger of crumbling. Finally, this year it looks like the work is going to start, but we still have the biggest hurdle to leap — getting neighbors to choose which company will do the work. When the project was first announced, my husband and I spoke and we decided that I would join the committee that would review the proposals and make recommendations to the neighbors. Once the project is underway, this committee will also meet with the construction company to make sure everything is going as planned and that the building as a whole stays informed about the project. I could have decided not to bother getting involved, as the majority of the unit owners have done, but we plan on living here for at least a couple of decades more and we care about our home just as much as any homeowner. And I have to say that I’ve really appreciated my organizing background during the process as it has helped keep everything and everyone on track while minimizing arguments and chaos. Short, effective meetings: I hate meetings that constantly go off topic and last forever. For that reason, I have gone to every meeting with the basic tools of paper and pen, and with questions prepared to ask the administrator or the construction company reps. Most of the others on the committee have lived in the building or neighborhood their whole lives, and they can easily get distracted by other topics. Gently, but firmly, I pull them back on topic, and being the “new” neighbor, they realize that they are merely reminiscing and then they get back to business. I took this summary to subsequent meetings. The administrator and architect corrected a few items that I had confused, and cleared up questions that all of us had. Only essential information: An even shorter two-page version has been given to every neighbor to be used as the basis for discussion; removing options, personal opinions of the committee, and details of the work to be done. The debate is going to be heated because it involves a lot of money so we decided to remove any extra information that might be used as an excuse to argue more. Basically, the government has declared that the work is necessary, and the only decision to be made is which construction company will do the work. Anything not related to that decision has been cut out completely. Learning from similar projects: In our area there are twelve towers of the same style that were built at the same time. Several of them have already had this work done. Using the connections that the long-time residents have, we’ve learned what extra work is not worth the effort and what details to pay attention to. For example, in a recent renovation two towers over, the balcony design included tear-shaped posts. When the wind comes down over the mountain, the new balconies now whistle. We will definitely be avoiding fancy balcony designs. So that’s my situation. But what does this have to with all of you? How can my experience help you? Short, effective meetings: Respect people’s time. If meetings go on too long or wander about, volunteers will be more likely to quit. If people want to chat, organize a post-meeting coffee where participants can go as far off topic as they like. Simple visuals: In any project, there is always an insane amount of information to be sifted through and decisions to be made. Reducing the options to simple tables and bullet points filters out extraneous information and focuses the decisions on what’s really important. Only essential information: While transparency is important, very rarely does everyone need to know everything. Create a committee to filter out details that the rest of the stakeholders don’t need. Also, when providing just the essential information, the committee ensures that decisions already made at the committee level aren’t rehashed by everyone else. Am I missing anything? What has your experience working on committees taught you about being productive in groups? Is “organizing” a dirty word? Certainly putting things away in an organized manner doesn’t do much if the underlying problem is that you need to unclutter. In his book Clutter’s Last Stand, Don Aslett wrote about “junk bunkers” such as shoe organizers (for shoes you never wear) and magazine binders (for magazines you’ll never look at again). That’s why professional organizers will tell you that buying cool containers (if you find you need them) is one of the last steps in organizing, not the first. If you look through the tour of minimalist Joshua Fields Millburn’s home, you’ll see he owns very few things, and that obviously works for him — and a similar approach works for others, too. But perhaps the things that add value to your life are work or hobbies that require stuff: a carpenter’s tools, an artist or crafter’s supplies, sports gear of various sorts, etc. For example, if you make a contribution by providing quilts to cancer patients and others facing a tough time, you’re going to have a stash of fabric. Or maybe you’re passionate about music, and you have a large collection of vinyl albums. You’ll want to have some organizing scheme for those. Another example: You may have family members whose well-being depends on a number of medicines and medical products, which you certainly want to keep organized. It pays to look through that stuff periodically to make sure you still want all of it. Do all those hobbies still have a meaningful place in your life? Did you buy a package of scrapbook pages but only really like half of them? Do you have old tools that have been replaced by better ones? Did you buy an album on speculation just to find it’s not to your taste at all? Have your prescriptions changed so that you now have medicines you no longer need? But once you’ve decided what to keep, you’re going to want to have it organized so you can find things when its time to use them. So yes — the first steps in organizing are to “imagine the life you want to live” (as Peter Walsh says in his book It’s All Too Much) and to discard those items that don’t help you achieve that goal. But after you’ve done the imagining and the uncluttering, you’ll also want to take whatever final organizing steps — giving everything a defined storage space, keeping like with like, containerizing, labeling — will help you store your things so you can find them later. Today we welcome guest post author Ryan McRae, who is the founder of the website TheADHDnerd, a blog dedicated to helping people with ADHD be more productive, successful and not ruin cast iron pans. He’s written a little guide based on this article if you’d like learn more. I get overwhelmed easily by choices. I can’t head into a clothing store and look at seven walls of jeans. I can’t choose between 20 flavors of ice cream. My brain just seems to wear down, overloaded by the decision fatigue. Even cooking meals, I look at with dread. Chop this, pre-heat that, sauté this thing over here. Ugh. Can’t do it. Recently I’ve fallen in love with something that helps me greatly reduce the choices. When I got my first cast iron pan, I made the biggest rookie mistake and put it in the dishwasher. It came out all rusted and gross. Alas, I had ruined it. (I would have recovered it had I known how, but I was not educated enough in the world of cast iron pans.) When I want to figure something out, I go all in. I got to work researching how to use these things and I found this video. Roast it. I’m a fan of roasting right now: chicken, vegetables, and more vegetables. I simply look up how to roast something and throw it in. Now everything I cook has to wind up on either a cookie sheet or a cast iron pan. Chop it? In the pan or on the sheet. Unwrap it? In the pan or on the sheet. Cook it? In the pan or on the sheet. There are several benefits to this method. I’ve been eating much healthier now and bringing my lunches (and dinners with my schedule) to work. Also, the clean-up has been super easy. I simply wipe out the pans when they cool down or give them a quick scrape (if they get bad, I season them.) I use parchment paper on the cookie sheets so it takes no time to clean them. I found that I looked forward to dinners and the preparation. It also made my shopping list much shorter. I highly recommend picking up a cast iron pan and getting started. 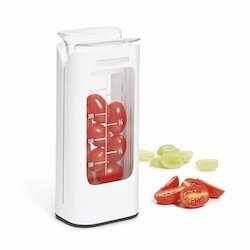 You’ll enjoy it and find you have a more relaxed experience when it comes to preparing and cooking food. I spent this past weekend cleaning my basement and enduring a life crisis. The two are related. Once the room was empty, the industrial vacuum came out, cobwebs were swept away, floors were swept and scrubbed, and shelving was dismantled, cleaned, and relocated. Every inch was polished and prepped for the contents of the “keep” pile to be neatly re-introduced. I drove the donate pile to the local donation station and later this week a team of professionals will arrive to haul the trash pile away. That should be all three piles sorted. Except there’s one problem. I lied. There are actually four piles. The fourth pile contains only a single item: my drum set. I bought this set of drums with money I saved by delivering newspapers when I was 13 years old. I started playing drums when I was seven, and to say that they occupied the first 23 years of my life is an understatement. Music, specifically percussion, was my life for two decades. In elementary school I played in the orchestra. In high school, it was band, orchestra, and jazz band. Some friends and I formed our own noisy rock band and tormented the neighbors with an endless racket. I took private lessons outside of school, and traveled to district orchestra events. I even attended music camp at our local college. Music was my social circle, my solace when times were tough, and my celebration when everything was going well. After high school I attended Berklee College of Music and gave snare drum lessons to the neighborhood kids in the summer. Then I finished with school, moved away, and got a job. The drums came with me, but I didn’t have much time for them. A few years passed and I got married. Soon enough we had a daughter, then a son. I had more responsibility at work. I continued to give lessons for about a year but that ended. My drums sat idle in the basement — for years… many years. We’ve written about parting with sentimental clutter before. I know it’s hard, and I know the strategies. I also understand that, in the end, memories are more important than things. But this feels like more to me. Real musical ability isn’t something that every person has. At the risk of sounding like a braggart, I do. I was really good at playing drums. To me, parting with the instrument feels like I’m throwing the gift away, too, and that’s not right. I understand that, if I haven’t touched my drums within the last 15 years, I probably won’t during the next 15 years either. Yet, I can’t bring myself to say goodbye. For now, they’re still in the limbo that is “Pile Four.” I’ve got until the end of the week to decided their true fate. Do you have any input, readers? Have I merely succumbed to the emotion of sentimental clutter? Or is there something more at work? There’s a TV show in the UK that has recently made its way to Spain and it has quite a different take on the clutter/declutter reality TV market. The Spanish title translates to You get dirty and I’ll clean it up which is much more expressive than the original UK title of Obsessive Compulsive Cleaners. The idea behind the show is that people who spend a large portion of their day cleaning their houses and getting rid of germs, go into houses that haven’t been cleaned in years. At the end of each episode the narrator tells us what each person has learned from the experience, and more often than not, the cleaners say that they have relaxed their cleaning regime at home and the ones whose house was organized and cleaned say that they have learned the value in keeping their house visitor-presentable. I’m not going to get into the perception of either side of the equation that the show generates as there is quite a bit of controversy over both sets of images. That’s not what today’s article is about. No, what I find fascinating is the learning from each other part. I’ve already talked about this in my post about the concept of good enough but I wanted to explore it further. At work, my former boss was all about the details and I’m a big-picture person. We often clashed (although that’s too harsh a word as conversations were always pleasant with her) about the number of details that needed to be considered before making a decision, as well as what, and how much of something should be kept, and for how long. We learned a lot from each other. She learned that sometimes details only confused issues and I learned that they also allowed us to make well-informed decisions and gave a sense of history to what we do at work. On the personal side of things, I come from a family where there’s always a silver-lining to any cloud and so planning wasn’t as important because there’s an opportunity for fun in every situation. My husband believes that more fun can be had if things are planned fully and that plan is kept. We’ve each learned to move a bit more towards the center. I have admitted that a great plan makes for a great day, and he allows that a plan not followed doesn’t mean total disaster. Those are just two situations where some sort of relationship with an opposite personality type enriches my life. How about you? How has a relationship of two extremes helped you? I’m not a parent, so I’m always interested in how those who are parents deal with child-related organizing issues: handling school papers, assigning chores, etc. Dave’s recent take on managing screen time gave me one more bit of real-life insight. Some of this makes intuitive sense to me. For example, letting young children Skype or FaceTime with distant grandparents or travelling parents seems like a good thing. And making sure screen time doesn’t take over a child’s life seems like an obvious goal. But I feel as though some of the limits are overly restrictive. No matter how much a parent might wish things were different, there are times when using a tablet or smartphone as a babysitter for a child age 5 or younger can be a lifesaver to a parent’s sanity and ability to get essential tasks done. Suzanne Janesse described on Babble.com how this works in her family. I’m sure many parents have their own similar tales. As Athena Tsavliris wrote in Today’s Parent, “Reality sometimes calls for the iNanny.” This doesn’t mean that these parents let their children use electronic devices for hours on end, with no controls on the content. But insisting that all screen time with young children should involve co-viewing seems unrealistic in many family situations. A recent small-scale trial by New York University researcher Susan B. Neuman, who served in the U.S. Department of Education under President George W. Bush, found that giving a group of preschoolers the chance to play for just 15 minutes a day on a popular app called Learn with Homer improved their reading skills 74% in a six-week summer period — without the help of a teacher. So, as with almost anything related to organizing, there are no absolutes that work for everyone. Just make thoughtful decisions about your family’s use of screen time, based on your individual family members’ needs, and adjust those decisions if they don’t seem to be working. A couple of months ago, fellow Unclutterer writer Alex wrote about how he uses the chore of ironing to practice active meditation. That works for Alex, but not for me. I do not like ironing. I find it tedious and annoying. It’s something I’d rather not do, but as my mother used to say, I don’t want to “… look like an unmade bed,” so I try reduce the amount of ironing I have to do with a few simple tricks. Now, I realize that ironing can’t be avoided entirely. Sometimes you must look neat, tidy and wrinkle-free (job interviews, important meetings, weddings, funerals, and so on). I’m not suggesting you should stop ironing entirely. But you’re an iron-phobic like me (or you’d like to spend less time performing this chore), this post is for you. I said that the dryer is your friend. That’s true, but friendship requires give and take. To encourage wrinkle-free results, don’t over dry your clothes. If your machine has a permanent press cycle, use it, as that will inject some cooler air. Also, remove them promptly as mentioned above. If you can’t do that, it’s a good idea to get them out while still slightly damp, as removing all moisture and then letting the load sit in a heap encourages wrinkling. This brings us to the washer. Just like we did with the dryer, look for that permanent press cycle. Also, avoid over stuffing the washer. Not only does the weight off all that clothing put a strain on the machine’s inner workings, it results in a wadded, wrinkly mass. (It also puts strain on the fabrics which can reduce the life of your clothes.) Also, try not to wash heavy items like jeans with lighter ones like tops. The former will crease the latter. Here are a few final tips for ironing less. Fold your clothes carefully so you do not accidentally add more wrinkles. Use good quality hangers to prevent wrinkle formation. 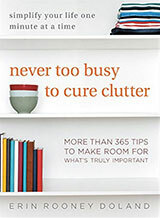 Avoid overstuffed drawers and closets. Use products like wrinkle-releaser ( you can also make your own if you’re the DIY type ). I’ve never used either so I can’t recommend them, but I know they exist. I’ve also read that you can use a hair dryer for quickie wrinkle removal, but I haven’t tested this either although Unclutterer writer Jacki assures me this works. (She’s not a big ironing fan either). She’s also used her daughter’s hair straightening iron to quickly press shirt collars and cuffs, and hung ball gowns and business suits in hotel bathrooms while running a steamy shower in order to remove wrinkles. It’s true that I can’t avoid ironing entirely. There are certain settings that demand neat, well-pressed clothes. But if you’re like me, follow these few steps to reduce time spend engaged in this boring chore.